The first official photo of X-Men Origins: Wolverine is released by USA Today featuring Hugh Jackman as Logan aka Wolverine. The film will trace Wolverine's past as he discovers the world of mutants and, ultimately, the ominous Weapon X program, which turns people into living weapons. Jackman is tight-lipped on plot details, though he says the film will hardly be a one-mutant story. Wolverine's nemesis Sabretooth "is going to play a big part in it. And there will be a good bit of cameos" of new and familiar mutants, he says. "But you can't give too much away, because fans are pretty hard-core. Their expectations go up a level every time you come out with a new film." It seems that Wolverine is getting in good shape. I hope this film will compensate X-men 3: The Last Stand's shortcomings and revive the franchise. 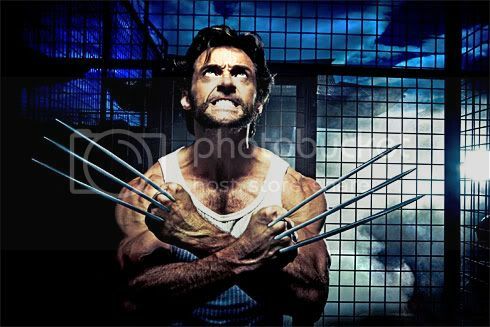 X-Men Origins: Wolverine will hit theaters on May 1, 2009 in the direction of Gavin Hood. FYI. Blogger’s Vote is the other 50% of final results, you can vote 1 up to 6 Blogs that you think is also deserving for the title “Entertainment Blog of the Month”. You can cast your votes by sending it thru email: juxxtapozze20[at]yahoo.com or by posting a comments on this page.